A set of New Year’s resolutions, developed as a tribute to a fallen best friend, is now the subject of a book from an eastern Iowa native. 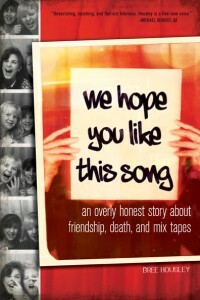 The book is titled We Hope You Like This Song: An Overly Honest Story about Friendship, Death, and Mix Tapes. Author Bree Housley grew up in Walcott, Iowa, but now lives in Chicago. She says the book evolved from a blog about an effort to complete 52 resolutions, one for each week of the year. The idea was to honor the memory of Housley’s best friend since fourth grade, Shelly Warner, who died tragically at the age of 25. Bree says she and her older sister, Courtnee, spent a year doing crazy things the out-going Shelly would have done. Shelly Warner passed away in January 2005 from complications caused by Preeclampsia shortly after giving birth to a daughter. Warner was a school teacher in Iowa Falls. Housley writes about coming to terms with her best friend’s passing as she and her sister live life as the Shelly would have — to the fullest. The resolutions ranged from giving Valentines to strangers, singing at a karaoke bar, and letting their boyfriends (now husbands) pick their outfits for a week. For each resolution or challenge Bree and her sister failed to complete, they donated $15 to the Preeclampsia Foundation.